Ina’s summer scalloped tomatoes with croutons turn the humble summer tomato into a spectacular dish worthy of serving for a casual lunch or fancified dinner party. I realize it’s been 90+ degrees here for what seems like weeks on end. And I realize that we haven’t turned off the air conditioning in probably close to 3 weeks. But I couldn’t help but turn on the oven this weekend! I missed making these Scalloped Tomatoes last month for Barefoot Bloggers and I wanted to make sure that I got caught up on my missed recipes before a very special event takes place next month…which I’ll share with you as it approaches. Yes, I’m going to leave you hanging like that! 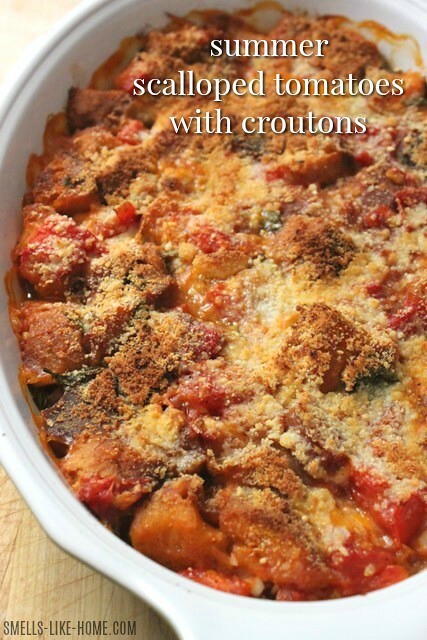 So these scalloped tomatoes with croutons are fairly unassuming. And frankly, the name is a little odd too since we Americans know dishes that are scalloped are usually sliced potato-based. Of course, you can slice tomatoes really thin but I’ve never heard of scalloping them before. And I have to say, this recipe doesn’t really do that in the traditional sense either. But it’s one that you can whip up in about 10 minutes and throw in the oven and by the time you’ve finished running around the house cleaning up, you’ve got an incredible lunch or light dinner waiting for you. Seriously, INCREDIBLE! This is where the unassuming part comes in. Humble and always delicious summer tomatoes almost caramelize in the oven and blend so amazingly with the toasted croutons that you’ll almost forget that you cooked summer tomatoes (gasp!) in the middle of July (double gasp!). And if you’re wondering about “what do I serve with these scalloped tomatoes” question, I’ll say that you won’t need anything. Kyle even commented that “you don’t even miss not having meat in this dish” so it’s definitely a meal in itself. I’d advise that you not wait until the fall weather approaches and it’s actually acceptable to turn your oven back on before you make these tomatoes. You’ll miss tomato season and will most definitely regret not using them here. Many, many thanks to Josie of Pink Parsley Catering for choosing this incredible dish to celebrate summer tomatoes! The other recipe for June was Sour Cream Coffee Cake, as chosen by Gwenn of Cooking in Pajamas, which we’ve made many times in the past and while we love love love it, we didn’t have an occasion to make it again recently. This scalloped tomatoes dish is dead simple to make but since you’re going to make your own croutons here, this step doesn’t make it a quick summer meal. To help with this, you can make the croutons a few days ahead and keep them in a zip-top bag at room temperature until you need them. Heat olive oil in a large (12-inch) saute pan over medium heat. Add the bread cubes and stir to coat with the oil. Cook over medium to medium-high heat for 5 minutes, stirring often, until the cubes are evenly browned. 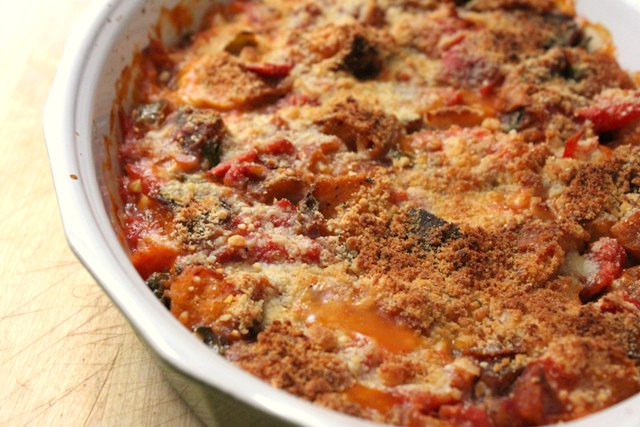 Pour the tomato mixture into a shallow (6 to 8 cup) baking dish. Sprinkle evenly with the Parmesan cheese. Bake for 35 to 40 minutes until the top is browned and the tomatoes are bubbly. Serve hot or warm. This looks amazing… can’t wait to make this one! I’m glad you got around to them – they really were amazing! And I can’t wait to hear the big amazing news for next month!! LOVE this recipe. Fixed them tonight – soooooo good! Your picture is far better but it was delicious anyway.